Cronin Insurance is proud to represent Progressive Insurance, one of the best insurance companies in the United States. The Progressive Group of Insurance Companies has always lived up to its name by being one step ahead of the insurance industry, and finding new and affordable insurance solutions. Progressive began in 1937 with the first drive-in claims office, became the first to introduce reduced rates for low-risk drivers, and then changed the Florida insurance shopping experience by offering a package that lets you bundle your Car Insurance with your Home Insurance. Combine the strength of an AM Best A+ rated company like Progressive with the personal service of a local agency like Cronin Insurance and you've got a winning combination. 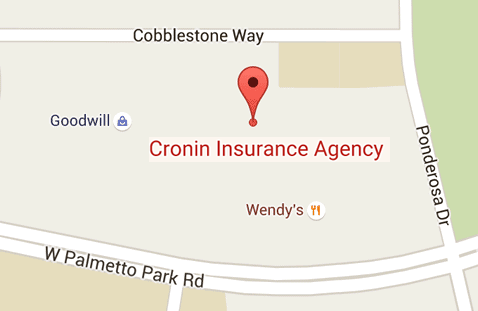 If you are looking for a local agent that represents Progressive, Cronin Insurance is your answer. We offer the full suite of Progressive Insurance products including Car, Home, Commercial Auto, Motorcycle, Boat, and RV insurance. And when you bundle two or more Progressive products together, you get a discount on each. The local agents of Cronin Insurance can help you understand your coverage options, guide you through the application process and help you once your policy is issued. We are local people you know, not anonymous voices over the phone. Contact Cronin Insurance today and we'll help you access the great products that Progressive Insurance has to offer.